The Tale of Despereaux release date was Friday, December 19, 2008. This was a Nationwide in theaters release. Once upon a time, in the faraway kingdom of Dor, there was magic in the air, laughter aplenty and gallons of mouthwatering soup. But an accident left the King broken-hearted, the Princess filled with longing and the townsfolk without their soup. Sunlight disappeared. The world became gray. All hope was lost in this land...until Despereaux Tilling was born. A modern fairy tale from visionary filmmaker Gary Ross, together with directors Sam Fell & Rob Stevenhagen, The Tale of Despereaux tells the story of several unlikely heroes: Despereaux (Matthew Broderick), a brave mouse banished to the dungeon for speaking with a human; Roscuro (Dustin Hoffman), a good-hearted rat who loves light and soup, but is exiled to darkness; Pea (Emma Watson), a Princess in a gloomy castle who is prisoner to her father's grief; and Mig (Tracey Ullman), a servant girl who longs to be a Princess, but is forced to serve the jailer (Robbie Coltrane). Tiny and graced with oversized ears, Despereaux was born too big for his little world. Refusing to live his life cowering, he befriends a Princess named Pea and learns to read (rather than eat) books—reveling in stories of knights, dragons and fair maidens. Banished from Mouseworld for being more man than mouse, Despereaux is rescued by another outcast, Roscuro, who also wants to hear the tales. But when the Princess dismisses Roscuro's friendship, he becomes the ultimate rat and plots revenge with fellow outsider Mig. 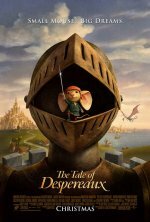 After Pea is kidnapped, Despereaux discovers he is the only one who can rescue her...and that even the tiniest mouse can find the courage of a knight in shining armor. In this tale of bravery, forgiveness and redemption, one small creature will teach a kingdom that it takes only a little light to show the truth: what you look like doesn't equal what you are. Adaptation of Kate DiCamillo's book "The Tale of Despereaux: Being the Story of a Mouse, a Princess, Some Soup, and a Spool of Thread."